The dark-to-light transitions enable energization of the thylakoid membrane (TM), which is reflected in fast and slow (OJIPSMT or OABCDE) stages of fluorescence induction (FI) and P700 oxidoreduction changes (ΔA810). A Thylakoid Membrane model (T-M model), in which special emphasis has been placed on ferredoxin-NADP+-oxidoreductase (FNR) activation and energy-dependent qE quenching, was applied for quantifying the kinetics of FI and ΔA810. 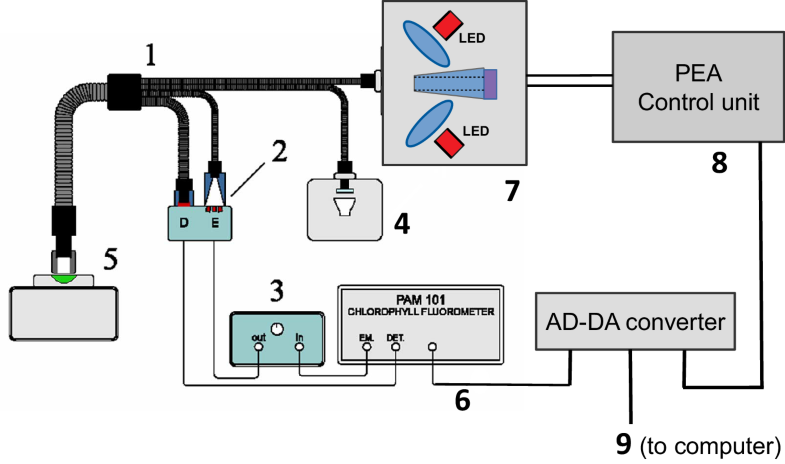 Pea leaves were kept in darkness for 15 min and then the FI and ΔA810 signals were measured upon actinic illumination, applied either directly or after a 10-s light pulse coupled with a subsequent 10-s dark interval. On the time scale from 40 µs to 30 s, the parallel T-M model fittings to both FI and ΔA810 signals were obtained. The parameters of FNR activation and the buildup of qE quenching were found to differ for dark-adapted and preilluminated leaves. 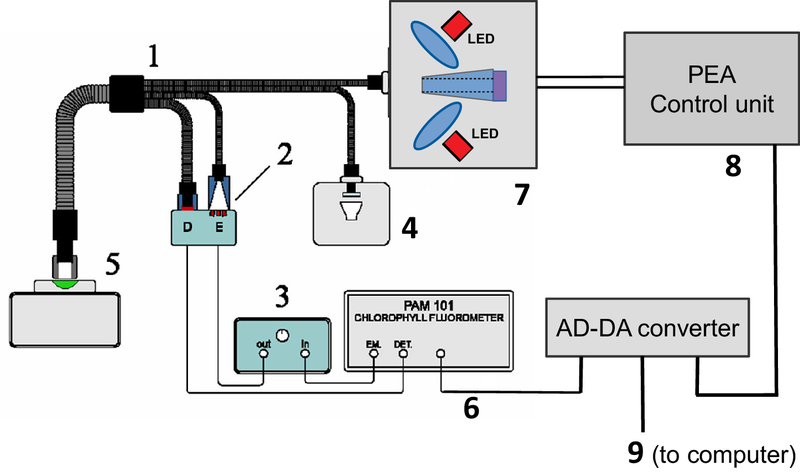 At the onset of actinic light, photosystem II (PSII) acceptors were oxidized (neutral) after dark adaptation, while the redox states with closed and/or semiquinone QA(−)QB(−) forms were supposedly generated after preillumination, and did not relax within the 10 s dark interval. In qE simulations, a pH-dependent Hill relationship was used. The rate constant of heat losses in PSII antenna kD(t) was found to increase from the basic value kDconst, at the onset of illumination, to its maximal level kDvar due to lumenal acidification. In dark-adapted leaves, a low value of kDconst of ∼ 2 × 106 s−1 was found. Simulations on the microsecond to 30 s time scale revealed that the slow P-S-M-T phases of the fluorescence induction were sensitive to light-induced FNR activation and high-energy qE quenching. Thus, the corresponding time-dependent rate constants kD(t) and kFNR(t) change substantially upon the release of electron transport on the acceptor side of PSI and during the NPQ development. The transitions between the cyclic and linear electron transport modes have also been quantified in this paper. This work was supported by the RFBR, Project No. 16-04-00318. We wish to thank Professor Wim J. Vredenberg (Wageningen University, The Netherlands) for thorough consideration of the manuscript and stimulating discussion. We are grateful to Reviewer 2 for critical reading and careful editing the manuscript. We thank Professor V. Z. Paschenko and Ph.D. I. V. Konyukhov (Biophysics Department, Moscow State University) for fruitful discussions. The interacting components of ETC comprise various redox states of electron carriers in a membrane protein complex (PSI, PSII, b6f) or mobile electron carriers (Pc, Fd, PQ). The model dynamic variable Xi(t), calculated using the ODE system (1), describes (Belyaeva et al. 2016) the time-dependent relative fraction (population) of the ith component multiplied by the total concentration of the ETC complex/mobile carrier in the system. The lumenal and stromal concentrations of H+, K+ and Cl− are also model dynamic variables. The stoichiometry of the system constituents in the thylakoid membrane (Fig. 2), for PSI, PSII, Cyt b6f complexes and PQ, Pc, Fd electron carriers was assumed to be 1:1:1:10:3:4. Modeling catalytic cycles of PSII, Cyt b6f and PS I (see Fig. 10). 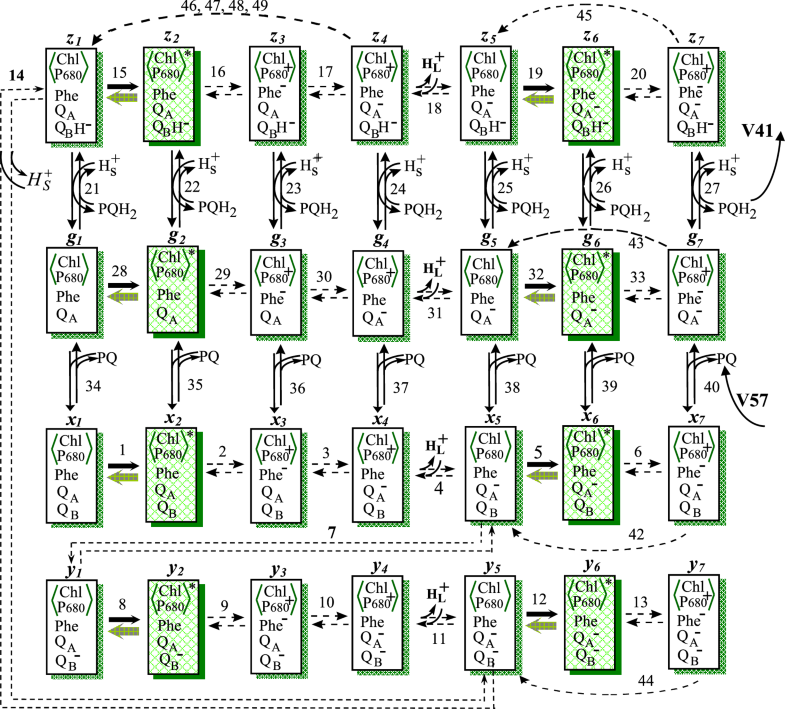 The electron carriers of PSII are modeled in reduced/neutral states for the cofactors Phe−/Phe and QA−/QA. In addition, the reduced/excited/ oxidized states of the primary electron donor P680 coupled to antenna, Chl-P680/(Chl-P680)*/Chl-P680+, respectively, are taken into account. The QB -site can exist in four redox states (in Fig. 10: neutral, reduced, protonated, double reduced, empty). Hence, the PSII model network has 48 hypothetical states whereas the model scheme in Fig. 10 contains 28 redox states of the PSII RC. Together with two states of PQ in the PQ pool, a set of 30 Xi(t) components is described when forward/backward transfer steps are given with rate constants kn/k−n (n = 1–49). Reduction of model forms was explained (Lebedeva et al. 2000; Belyaeva et al. 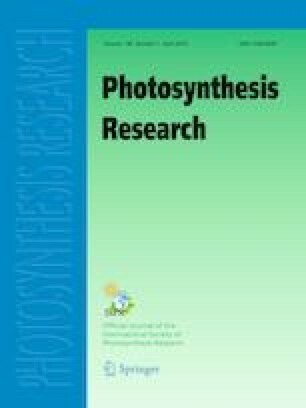 2015, 2016) with respect to information about the primary photosynthetic reactions (Govindjee 1982; Renger and Schulze 1985; Baake and Schlöder 1992; Dau 1994; Renger et al. 1995; Stirbet et al. 1998; Lazár 2003). 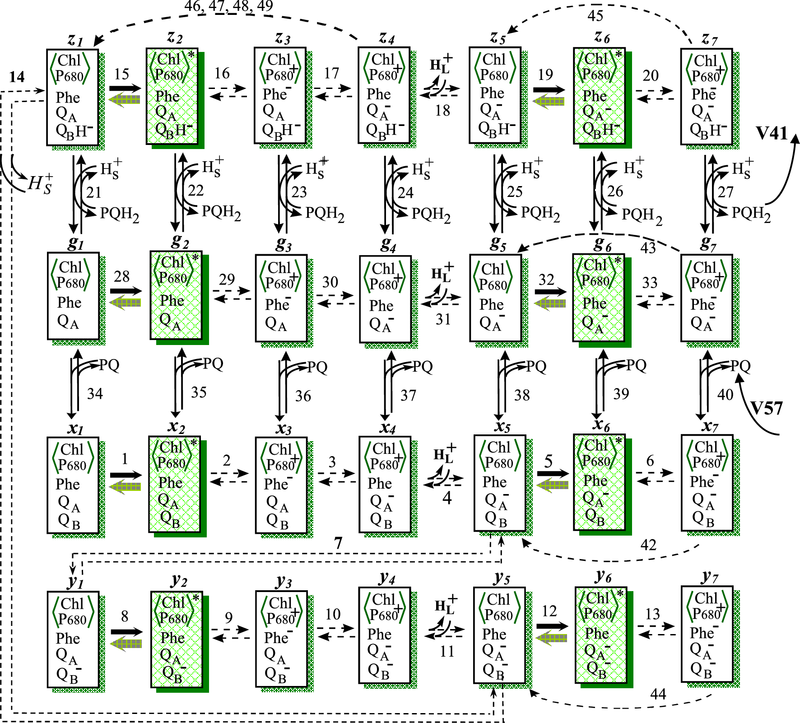 Figure 10 includes the light-induced reactions of the PSII model pattern: charge separation (2, 9, 16, 29), charge stabilization (3, 10, 17, 30), electron transfer from QA−QB(−) to QAQB(H−) (7, 14), PQH2 release (21–27) and refilling of the empty QB-site (34–40). The WOC operation (reactions 4, 11, 18, 31) was assumed with one proton released into the lumen for one electron, transferred from WOC via YZ to P680++ averaging the Si cycles stoichiometry (refs. in Renger 2004, 2012). For reactions with numbers n = 1, 5, 8, 12, 15, 19, 28, 32 the text in “Updating the Thylakoid Membrane model” introduces Eqs. (2)–(5) explaining the entity of gray backward arrows in Figs. 3 and 10 that define the sum of deactivation processes of 1Chl* via FL emission and heat dissipation. Moreover, dissipative energy losses are defined for closed RCs. The irreversible reactions of non-radiative recombination are shown (Fig. 10) by dashed arcs as transitions 42–45 from the 7th (with Phe−P680+) to the 5th forms (x7, g7, y7, z7) → (x5, g5, y5, z5) and transitions 46–49 from the 4th (with QA−P680+) to the 1st forms (x4, g4, y4, z4) → (x1, g1, y1, z1). The Cyt b6f model was shown earlier in details (Lebedeva et al. 2002; Kamali et al. 2004; Rubin and Riznichenko 2009), including the set of redox reactions known as the Q cycle (Hope 1993; Tikhonov 2014). The reduced scheme in Fig. 4a shows transitions in two catalytic centers at the lumenal (p) Qo or stromal (n) Qi sites that provide proton coupled electron transfer (PCET) reactions that can oxidize/reduce PQ/PQH2 molecules. Light-induced electron flow via PQH2 diffusion delivers electrons into the Q cycle (step 41, Figs. 4c, 10) while mobile Pc and bL heme are reduced in parallel (Fig. 4a, steps 50, 51 for the transitions f1 → f2 and f3 → f4). Step 52, f2 → f3 across the membrane reduces the heme bH and PQ reduction in the catalytic stromal center becomes possible (f4 → f2 and f3 → f1) to produce the semiquinone (steps 53, 54) and plastoquinone (steps 55, 56) species that are protonated by two protons consumed from the stroma. The PSI model is shown in Fig. 4d. Because of the very rapid (10− 12–10− 9 s) ET along the A0–A1–FX chain (Brettel 1997), only the final electron acceptor in PSI, shown as FeS (uniting clusters FX, FA, and FB) in Fig. 4d, is considered. Under light, states with P700+FeSr are generated while two ways are active via steps 61, 62 or vice versa by steps 64, 63 giving rise to P700+ reduction from Pc and ET from reduced FeS complex to Fd. Subsequently, at the PSI acceptor side, the ET outflow is supplied by Fd mobile carriers that participate in both LEF and CEF fluxes: step 65, and steps 58–59, respectively (Fig. 4b).